NEW YORK -- Hillary Clinton is hitting another campaign milestone: Most retweeted tweet. 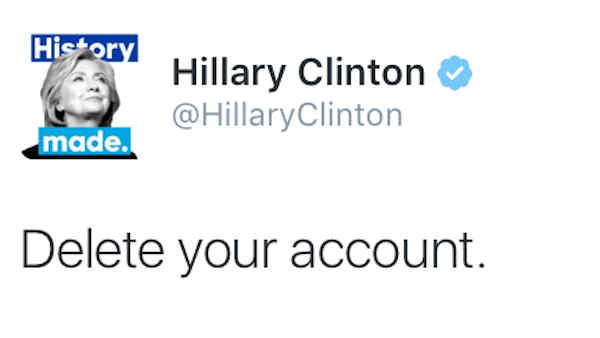 "Delete your account," her campaign wrote, in response to a message from Donald Trump mocking President Barack Obama's endorsement of the presumptive Democratic nominee on Thursday. The message quickly went viral, getting retweeted 130,000 times in about an hour. "Delete your account" is a typical joke used on the social media site, often deployed when someone has failed to be funny. Trump, who's known for his brash voice on the site, has 8.76 million followers to Clinton's 6.6 million. The exchange prompted reactions from across the political spectrum. "If anyone knows how to use a delete key, it's you," replied Reince Priebus, chairman of the Republican National Committee, in a reference to the messages Clinton deleted from the private server she used for her correspondence at the State Department. Former New York Rep. Anthony Weiner also weighed in, tweeting: "Too late to for some of us." Weiner resigned his seat in Congress after sexual messages he sent over the social media site became public. Trump also responded, echoing Priebus' sentiment.